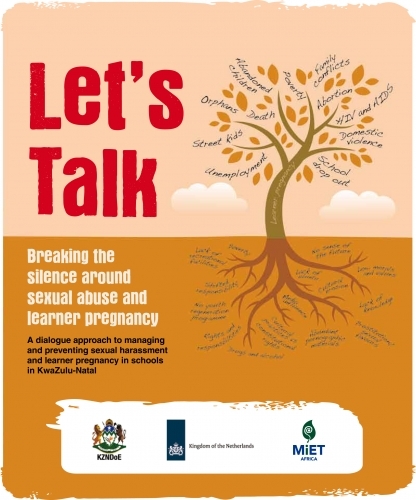 Let’s Talk has been developed out of a pilot project conducted in KwaZulu-Natal schools. It focuses on a dialogue approach to managing and preventing sexual harassment and learner pregnancy in schools. The project aimed to support teachers with strategies for coping with the challenges of sexual harassment in schools so that they are able to fulfil their professional roles and responsibilities. The programme was implemented by the KwaZulu-Natal Department of Education (KZNDoE) Gender Desk in partnership with MIET AFRICA and underpinned by action research conducted by the University of KwaZulu-Natal’s School of Education. In addition to the above booklet, the material also includes six posters targeting teachers, learners and caregivers.